Country-Fried Steak is also known as pan fried steak, country fried steak or CFS. This is a classic dish that must be served with mashed potatoes (at least according to my husband). Other like it served with biscuits and gravy. You might be surprised to learn that there is no chicken in Chicken-Fried Steak. It is tenderized round steak (a cheap and tough piece of beef) made like fried chicken with a milk gravy made from the drippings left in the pan. The steak, when fried, should look just like the coating on a piece of Southern fried chicken. The traditional way to cook CFS is in a large cast-iron skillet with very little oil. Served with “the works” means accompanied by mashed potatoes, gravy, greens, black-eye peas, and cornbread. Country Fried Steak (CFS) has a few other names throughout the U.S. and the world such as chicken fried steak, pan fried steak, weiner schnitzel, milanesa, and probably more names. In the late-nineteenth-century, other beef-growing areas of western Louisiana, Texas, Oklahoma, and as far north as Kansas have also adopted this as one of their favorite foods. It is a down-home, affordable meal that is sure to satisfy no matter what side of the Mason-Dixon you might be on. As a life-long resident of Kansas, and with an ancestry of Kansans that date back several generation, I think I have a fairly good grasp on our regional foods. Many of our native foods are adopted from other regions, which makes it difficult to say some dish belongs to our region. Many of my favorites are often considered Southern Cooking, but Kansans only adopted some of the South’s cuisine, not all. Probably the easiest way to figure out a region’s cuisine, is to see what the small town cafes have on their menus. In Kansas, I think it would be unusual to find one that did not offer Chicken Fried Steak or as has been often renamed to avoid confusion for non-natives Country Fried Steak. It is rare to find “greens” or black-eyed peas on a menu in Kansas. Veggies offered are usually one or two of the following: green beans, corn, peas, cooked carrots, or mixed vegetabkes. Cream gravy is the most often served on chicken fried steak. The way I learned to make chicken fried steak from my mother is different than any others I have ever seen. Her recipe may have been a short-cut she picked up somewhere along the way. Take beef round steak, and trim off whatever fat you can. 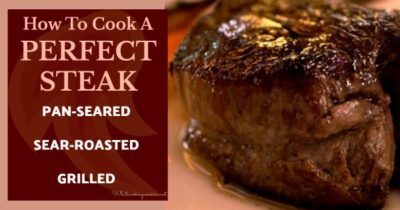 Use a meat tenderizer hammer, and beat each steak until it is almost falling apart. Make a mixture of eggs, salt, pepper, and a little milk (proportion like you would if you were making an omelet). Dip steaks into egg mixture so that they are completely coated. Crush saltine crackers, and coat the steaks with them. Fry in a pan using lard, shortening, or oil (depending on your preference – I use canola oil now, but am sure we used lard when I was a kid). When browned on one side, flip and fry until both sides are browned. Serve with gravy. Tip: To keep the steaks hot until you can get them all fried, place them in a pan or on a cookie sheet in the oven at about 300 degrees F.
Learn more about the history of Chicken-Fried Steak. In another pie plate or shallow dish, beat eggs and milk. Coat steaks in flour mixture and then dip into egg mixture. Dredge in flour mixture again, and let stand 2 minutes.